Flat through the summit of Mount Moriah is today, it was not always so; extensive substructures still exist beneath the surface, and there is reason to believe that recourse was held to something of the kind from the earliest days. Moreover, the ground level has been raised many feet by the accumulated debris of ages. 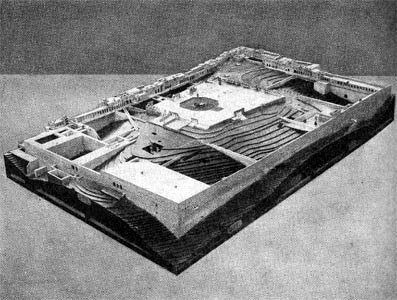 This model, showing the original contours of the hill in relation to the buildings round it, will help in realizing the problems of the Temple builders.